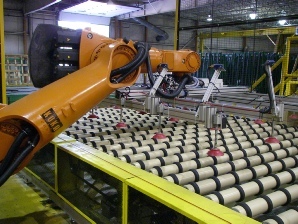 Robots are highly flexible tools and are implemented more often into float lines or glass processing lines in recent years. This process was driven by the desire of glass manufacturers to use optional stacking modes like air side or tin side orientation on the rack without adding equipment or driving up the use of floor space. 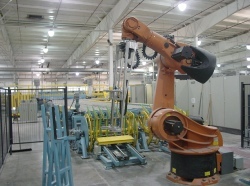 Robots, compared to previous generation stacking equipment allows also for stacking in different matrix on racks, like multiple rows or tears. 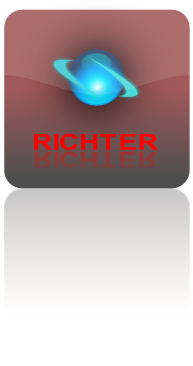 RICHTER’s Robot Cells are customized for the individual task. Other installations allow for stacking of packs of glass which are in previous operations accumulated. The robot stacks the packs at its optimised cycle time while the individual lites are packed by fast accumulators in front of the robot. This set-up of accumulating and stacking of packs with the robot results in very fast cycle times. Gantry Style Robots and multi-axis arm robots. Hager GmbH, a German company located in Bavaria, is the leader in developing gantry robots for the glass industry and has major applications in Float and Coating Lines and more recently Solar Glass Fabrication. 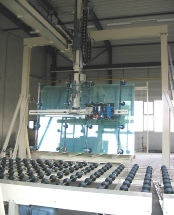 Richter Enterprises Glass Robotics have been implemented into float lines and solar glass applications.